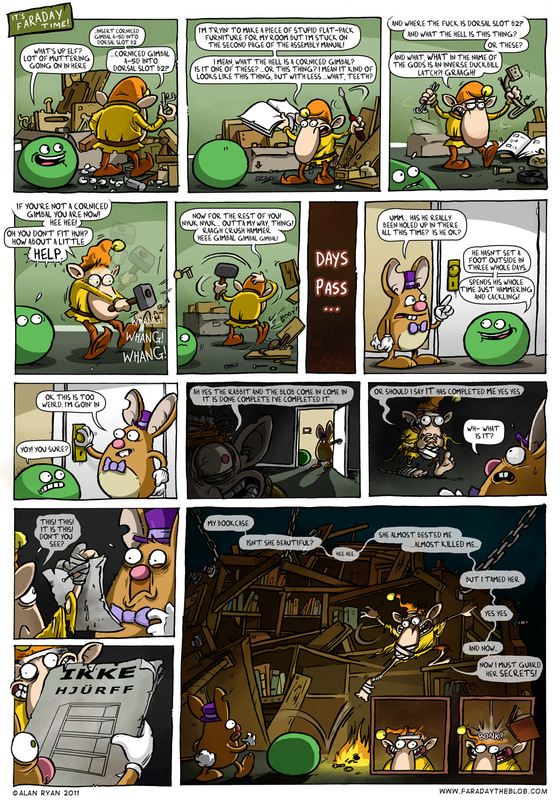 This entry was posted on Wednesday, December 7th, 2011 at 11:48 pm and is filed under Comics. You can follow any responses to this entry through the RSS 2.0 feed. You can skip to the end and leave a response. Pinging is currently not allowed. Someone make a trip to Ikea lately? I know it’s probably not, but I am really wanting this to be a series / story arc. Panel 9 makes me happy to be alive! Love the instruction booklet, you’ve definitely been IKEAed. I must say, they do a great bookcase. I think this may be my favorite Faraday comic ever. I also think I need to seriously reconsider buying any flat pack furniture anytime soon, for the sake of my sanity. I love it! ps: think we’ll stick to the Ikea restaurant from now on! ha ha love it. we’ve all been there. worth waiting for…. as was the bookshelf! just love the last 2 windows! ps can I come and watch next time you get a flatpack?? NKH - wasn’t planned as a series unfortunately – might do a follow up ‘what happened next’ kind of thing some day though. Despite the trevails with ikee it could have been worse. In my day their equivalent were MFI, a vastly inferior outfit. MFI sounds like a covert-ops British Intelligence Agency. Flatpack night vision goggles. This is literally the best comic ever. Literally. Literally the best comment ever!